The unemployment rate in Italy has been considerably high compared to other major developed European countries, but today we saw a major decline which came as a surprise to me. Surely, it must be a surprise for Italian leaders who are pushing for a higher budget deficit than what the EU would have wanted. The deficit for next year’s budget is supposed to be at 2.4% of the GDP which the European Commission is set to reject, according to La Repubblica. However, Di Maio and Salvini must be pretty happy today as the unemployment rate declined considerably. Last month, the unemployment rate came at 10.4%, which was a big decline from the previous month which stood at 10.9%. That was one surprise, but we got a bigger surprise as well. The unemployment rate was expected to tick higher to 10.5% but instead, it declined again, even faster this month. Unemployment rate fell to 9.7% as today’s report shows and last month’s was revised lower to 10.2% from 10.4% in the first reading. 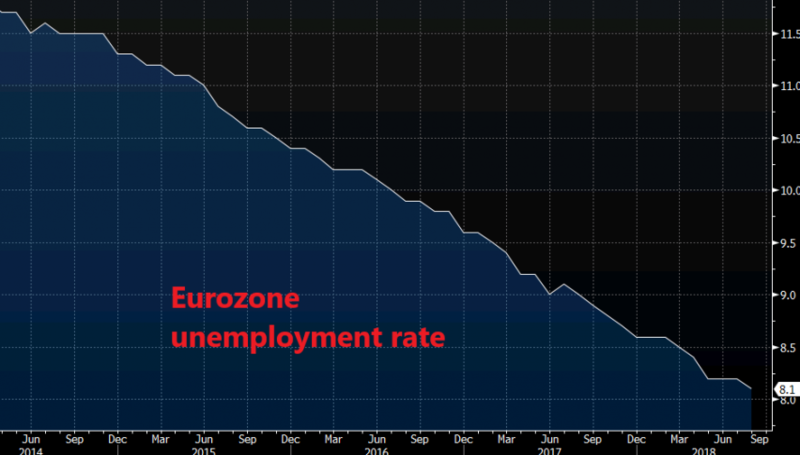 This is a very encouraging piece of data and it must have helped the Eurozone unemployment as well, since the unemployment rate fell to 8.1% in the Eurozone from 8.2% previously. The labour market has been tightening in Europe and it seems that it is tightening pretty fast in Italy as well. One thing is going right for Italy right now and stocks have been recuperating today after the small crash last Friday. EUR/USD has also been feeling better during the European session and is around 40 pips higher so far. Although the climb seems weak, there might be a good chance to sell this forex pair soon.